By the end of 1985, a law had been passed by the Italian Parliament that paved the way for the reorganisation of the Milan airport system. Malpensa was designated as the centre for all services covering northern Italy, while Linate Airport was downgraded to a domestic and short-haul facility. "Malpensa 2000", as the plan was called, included the construction of a new terminal as well as the development of fast, efficient connections to Milan's city centre. The European Union recognised this project as one of the 14 "Essential to the Development of the Union" and provided 200 million to help finance the work. Construction started in November 1990; Malpensa airport was re-opened eight years later. During the night of 24/25 October 1998 Alitalia moved the majority of its fleet from Rome Fiumicino Airport where it had been flying from for over 50 years to Malpensa Airport. The airport started a new lease of life as the Italian flag-carrier's main hub. Alitalia added up to 488 movements and 42,000 passengers a day at the facility which, by the end of 1998, had handled 5.92 million passengers (an increase of more than two million over the previous year's figure). In 2008, a new development plan was launched by Societa Esercizi Aeroportuali SpA (SEA), valued at 1.4 billion, to include a third pier for Terminal 1 and the construction of a third runway. In a surprise move, however, Alitalia announced its decision to revert its main hub back to Rome Fiumicino Airport due to 'high operating costs' at Malpensa Airport. Alitalia did not pull out of Malpensa altogether, and continues to fly several domestic and European services from Milan and two intercontinental flights (to New York City and Tokyo). However Malpensa lost around 20% of its daily movements, a decrease from 700 to 550, which resulted in only 19.2 million passengers passing through in 2008. The airport continued to suffer during 2009, when the international financial crisis and higher fuel prices caused a reduction to only 17.6 million passengers that year. Milan's Suburban Line S10 (Milano RogoredoMilano Bovisa) has run to Malpensa Airport/Aeroporto since June 2010. Trains call at: Ferno, Busto Arsizio, Castellanza, Rescaldina, Saronno, Milano Bovisa, Milano Lancetti, Milano Porta Garibaldi M2-M5, Milano Repubblica M3, Milano Porta Venezia M1, Milano Dateo and Milano Porta Vittoria. The service was terminated in October 2012. The Malpensa Varese Mendrisio (CH) Lugano (CH) line is currently under construction, providing a direct connection between Malpensa Airport/Aeroporto and the south-eastern part of Switzerland. There are plans to connect Gallarate Station and Milan's Centrale Station (FS), which is currently a terminus station with no through tracks, to allow more convenient access to high-speed international lines. Malpensa Shuttle and Malpensa Bus Express connect the airport to Milan Central station (Trenitalia's National Railway hub) and for Milan's Metro network. The shuttle bus calls at Terminals 1 and 2, Busto Arsizio and Milan Fair (on request). Journey time is 6070 minutes. A free, 24-hour shuttle bus provides access to Terminal 2 from Terminal 1. The bus leaves every 7 minutes. Journey time is 1520 minutes. ^ GmbH, DVV Media Group. "FedEx Express opens new Malpensa hub Air Cargo News". Aircargonews.net. ^ "Assaeroporti Associazione Italiana Gestori Aeroporti". Retrieved 2 June 2015. ^ a b "Statistiche Assaeroporti". Assaeroporti.com. ^ "Orario voli Malpensa Orari voli aeroporto Milano Malpensa". Milanomalpensa-airport.com. 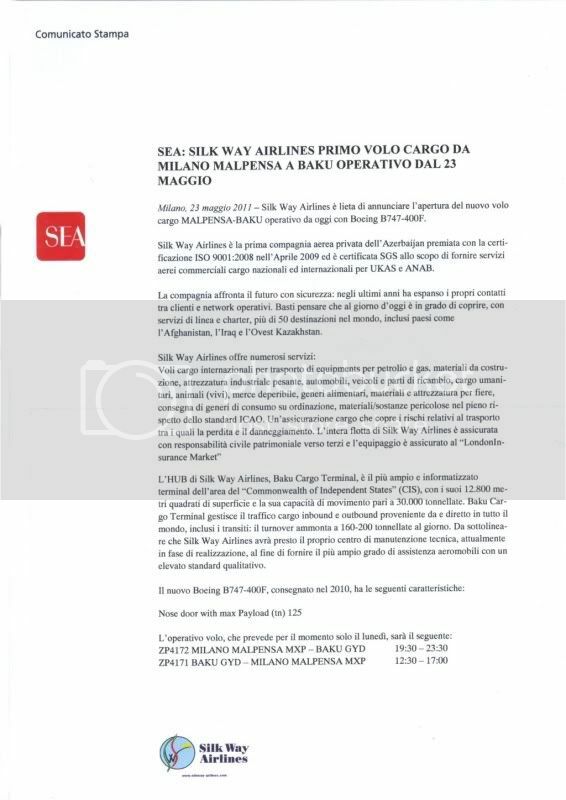 ^ "Air Italy riapre la Milano Malpensa Cagliari". Italiavola.com. 5 December 2018. ^ "Alitalia resumes Milan Cairo service from late-July 2019". routesonline.com. 14 February 2019. ^ "Alitalia flight Milan Cairo". alitalia.com. 24 February 2019. ^ "Alitalia resumes Milan St. Petersburg service from late-July 2019". routesonline.com. 5 February 2019. ^ "Alitalia resumes Milan Tel Aviv service from late-July 2019". routesonline.com. 14 February 2019. ^ "Alitalia apre la Milano Malpensa Rostock" [Alitalia opens Milan Malpensa - Rostock] (in Italian). Italiavola. 12 February 2019. Retrieved 19 February 2019. ^ "Blue Panorama : nuovo Milano Malpensa Olbia estivo". Italiavola.com. 8 January 2019. ^ "Collegamento Milano Malpensa Malpensa Express". Malpensaexpress.it. Retrieved 7 November 2010. ^ "Malpensa Da dicembre parte il treno Malpensa-Milano Centrale | Lombardia | Varese News". .varesenews.it. 31 July 2010. Retrieved 7 November 2010. ^ "Castellanza Malpensa express più veloci e nuovi suburbani, così cambia l'orario | Lombardia | Varese News". .varesenews.it. 30 January 2010. Retrieved 7 November 2010. This article based on this article: Malpensa_International_Airport from the free encyclopedia Wikipedia and work with the GNU Free Documentation License. In Wikipedia is this list of the authors .